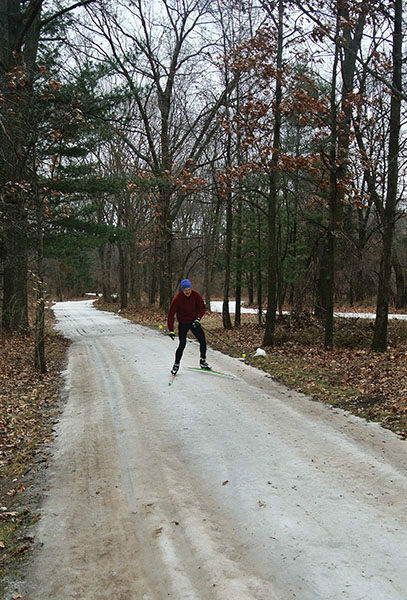 When it is cold in Southeast Michigan but there’s no snow serious Nordic skiers head to Huron Meadows Metropark for a workout on Buck’s Run. 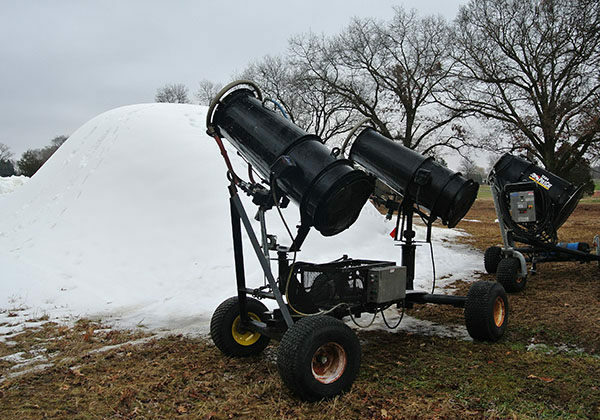 In 2012 the Huron-Clinton Metropark in Livingston County purchased four snowguns and began doing what Mother Nature wouldn’t at times; make snow. The park staff used the guns to create a small, white mountain and then transported the snow to Buck’s Run where they groomed it into a mile-long loop with a skating lane and tracks for classic skiing. Viola! Skiing even when the lawn at home is brown and grassy. But when there is snow in this corner of the state that’s even more reason for everybody to grab their skinny skis and visit Huron Meadows. Since the late 1990s, this picturesque 1,539-acre park has dedicated itself to the Nordic sport with an improved trail system, state-of-the-art grooming and top-of-the-line rental equipment at its ski center. 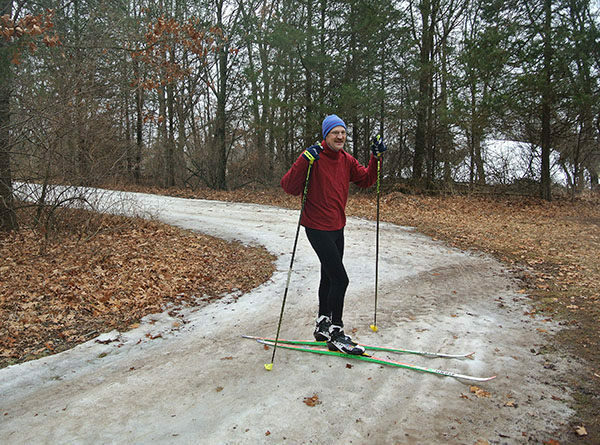 “We’ve replaced Kensington as the crown jewel of cross country skiing in the Metropark system,” said one park official. 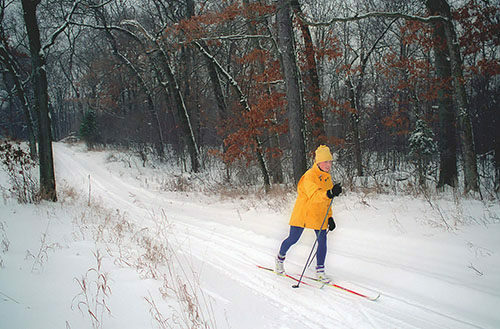 Located on the banks of the Huron River, less than 3 miles south of downtown Brighton, Huron Meadows features almost 16 miles of ski trails with 10 miles groomed for skate skiing. While 5.4 miles of the system, Coyote Run and Hawk Hills, is spread across the park’s 18-hole golf course, the rest winds around Maltby Lake, across open meadows and through the scenic woodlands and wetlands that span from Hammel Road south to the Huron River. 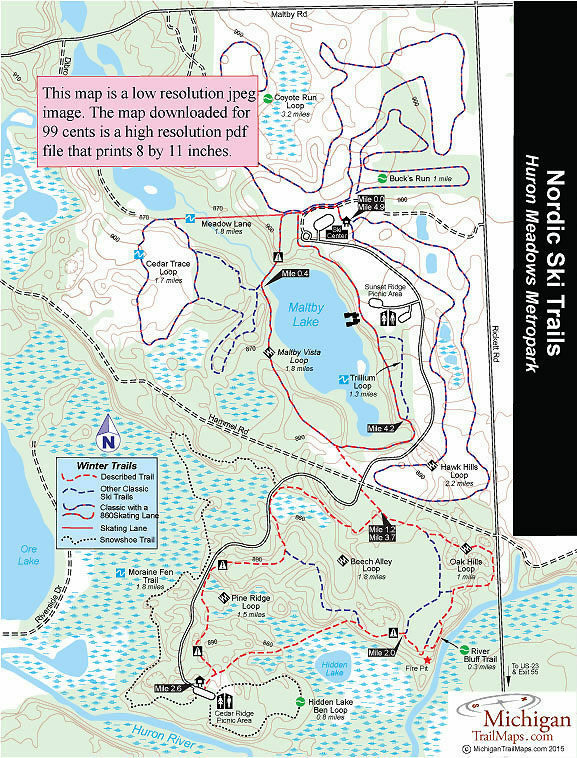 More than 6 miles of trail is posted with black diamonds but these are not overly challenging runs and overall the area is ideal for beginner skiers and families of mixed abilities. Add a ski center where you can enjoy a cup of hot chocolate at the north end of the park and a fire pit that warms up skiers on the weekend at the south end and you have all the amenities any cross country skier could possible want. Even when Mother Nature isn’t cooperating. The 4.9-mile run described here begins and ends at the Ski Center and combines portions of the most scenic trails the park has to offer; Maltby Vista, Beech Alley, Oak Hills and Pine Ridge. This loop is for classic skiers as none of the trails south of Hammel Road are groomed for skate skiing. There is no direction of travel at Huron Meadows as the trails are groomed with a pair of striding tracks. But most skiers follow Maltby Vista in a counter clockwise direction. Two trails, the 1.5-mile Moraine Fen and the 0.8-mile Hidden Lake Bend that depart from the Cedar Ridge Picnic Area, are designated snowshoe routes. The main trailhead is located just east of the Ski Center parking lot and from there several trails head west including Maltby Vista. You briefly skirt the golf course before swinging south (left) into the woods at a major junction that includes Coyote Run heading north and Meadow Lane continuing due west. From the junction you’re immediately greeted by steep hill, no doubt the reason Maltby Vista is rated as a black diamond, but it’s a straight downhill run that most people, even beginners, find not overly challenging. You bottom out to cross a stream flowing into Maltby Lake and at Mile 0.4 reach a junction and a bench. To the west is Cedar Trace, a 1.7-mile loop that winds through the open meadows south of Dibrova Lake and a great way to add mileage to this outing. Maltby Vista continues south through a rolling terrain where there are views of the lake through the trees. You break out to a junction on the edge of an open meadow where you head right to leave Maltby Vista and continue south of Hammel Road, reached at Mile 1. For safety reasons, it’s important to remove skis before crossing the dirt road! On the other side you quickly leave the park road to head east (left) along the Beech Alley loop. Another marked junction is reached at Mile 1.25 where you head east again (left) to continue on Oak Hills loop. This hilly loop eventually swings sharply south to parallel the Huron River. Along the way you can detour onto River Bluff Trail for a better view of the water or to warm up at the fire pit that the park staff maintains during the weekends. At Mile 2 you return to Beech Alley loop and head left where another steep downhill leads to the junction with Pine Ridge loop (left again). A more gentle descent follows while the scenery remains impressive as the forest gives way to a winter wetland when you bottom out. As far as you can tell, you could be someplace up north at this point. A long climb awaits you on the other side of the wetland and from there you break out in a meadow on the edge of the Cedar Ridge Picnic Area, reached at Mile 2.6. A spur leads to the trailhead and parking area where on the other side it’s possible to view the Huron River. In the meadow Pine Ridge heads north as a hilly run that bottoms out near the park road, passes another scenic wetland and then makes a long climb to its junction with Beech Alley. Head west (left) twice and you’ll be back at the Hammel Road crossing at Mile 3.8. Returning to an earlier junction on the north side of Hammel Road, head right (east) to finish off Maltby Vista loop. It a mile back to the Ski Center along the east side of the lake that includes descending around its south end and then climbing up the bluffs that form its east shore. Along the way you pass junctions for Trillium Loop, numerous views of the lake below and an observation deck in the Sunset Ridge Picnic Area where a massive stairway leads down to Maltby’s frozen surface. Eventually you return to the edge of the golf course where to the right is the trailhead and Ski Center, reached at Mile 4.9. 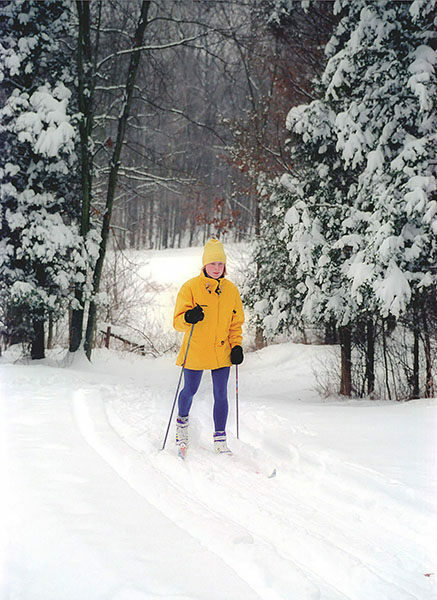 The Huron Meadows Ski Center offers food service, a warming area and lunch room and equipment rentals during the ski season. The center offers both skating and classic ski rentals. A daily vehicle pass or a Huron-Clinton Metropark annual permit is required to enter Huron Meadows. There is also an additional $5 per person fee to ski Buck’s Run. Huron Meadows is open 7a.m. to 8 p.m. daily from November to April and 7a.m. to 10 p.m. daily the rest of the year. The Ski Center is open from noon to 7 p.m. on Friday and 9 a.m. to 5 p.m. on Saturday and Sunday during the winter. From US-23, depart at exit 55 and head west of Silver Lake Road and then quickly south on Whitmore Lake Road. In a few hundred yards turn west on Winans Lake Road and then north on Rickett Road in a half mile and follow it a mile to Hammel Road. The park entrance is reached by heading west on Hammel Road. For more information contact Huron Meadows Metropark (734-426-8211; www.metroparks.com/Huron-Meadows-Metropark).